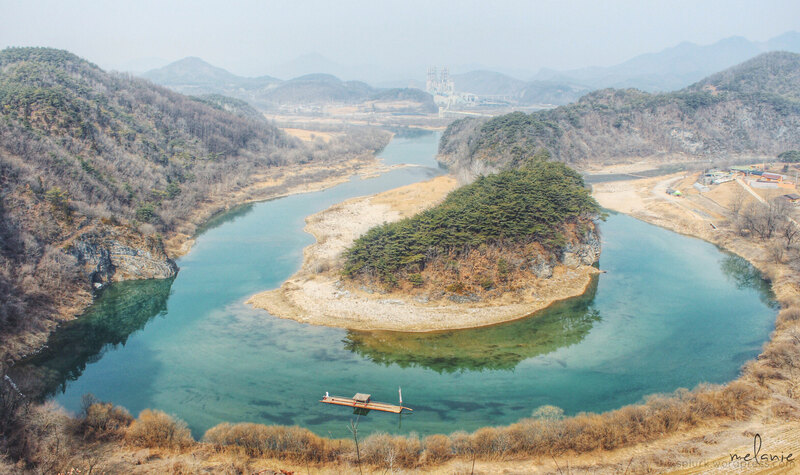 Korea inside Korea – it’s like Inception, only that it’s real and you can even go on a trek in it. This is Hanban-do. It is an islet found in the county of Yeongwol (영월). Two days ago, I had the opportunity to visit this place for a program called “이야기가 있는 풍경” (Landscapes with Stories), a show produced by KBS 춘천. It is a two-hour drive from Chuncheon. I tried searching in Naver how to get there by commute, although results show that you can take a bus from 동서울종합터미날 (Dong Seoul Bus), I don’t highly recommend it as the transportation facilities here aren’t that developed yet. I supposed it is better to go here by renting a car and looking for it via GPS navigation. Anyway, Hanban-do is a complete natural replica of the Korean Peninsula. The islet, just like Korea, has seven provinces. On the right side, there is a tiny village which offers a 뗏목 (Ddetmok) boat experience that will drive you around the islet. The boat will stop at ‘Jeollado’ area and you can start trekking from there up to the North Korea division! The trek rail isn’t that long but the peak does really gives you a 만족스러운 느낌 satisfying feeling from the magnificent landscape you’ll see – it would have been nice though if we went there on a spring or autumn. Because it was almost the latter part of winter, most of the trees are dead. What was interesting though is that, if you’d look closely at the islet’s photo, you’ll see a cement factory on the background. Despite its presence, the water was crystal clean. There were even a lot of fish in it – which is definitely a good sign of a healthy nature. After visiting Hanban-do, we went to a Korean 가옥 (Ga-ok). I am not sure though how a Ga-ok differs from the Korean Hanoks we saw in Bukcheon and Jeonju. However, this Ga-ok in Yeongwor is a very special one. According to the owner, this house was built 300 years ago! It was well preserved and renovated but still they use 아궁이 (Agung-i), a traditional way of heating system. If you remember the Kamasot I showed in my former blog post, then it looks exactly that one. This Ga-ok offers ‘hanok stay’ for foreigner and Koreans as well. Price range from 130~400 thousand won per night. Again, it is difficult to visit this place because I haven’t seen any bus stops nearby nor taxis! Before we ended our 2 days trip to Yeongwol, we stopped by Kwaeyeonjae Ceramic Museum (쾌연재도자미술관). It is a small museum along the highway and you can see a few artworks and ceramics collected and made by the owner and her husband. There, they taught me how to make my own ceramic piece. One of the guys told me that there is this popular piece in the Philippines – a baby who is praying. I think he was referring to the Sto. Niño, so I told them I’ll try to make a similar piece… but it ended… well, so-so. haha.